Levko Borovykovsky (Feb 22 (Mar 6), 1806 – Dec 26, 1889 (Jan 7, 1890)) – Ukrainian romantic poet and folklorist. Born in the village (now – Khorol district, Poltava region) in a family of small landowners (cossack). He studied at the Khorol district school (1819 – 1822), Poltava gymnasium (1822 – 1826), Kharkov University (1826 – 1830). In the university under the influence P. P. Gulak-Artemovsky began collecting Ukrainian folklore. At the same time wrote and published a number of original and translated poetry. 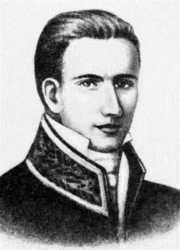 In 1831 – 1837 Borovykovsky taught at Kursk gymnasium, from 1838 to (tentative) 1859 served as a teacher and school inspector in Poltava gymnasium. In these years, he published his works in Ukrainian almanacs ("Ukrainian Almanac", Kharkov, 1831; "Swallow", St. Petersburg, 1841) and Russian magazines. In 1852 in Kiev via A. Metlynsky was published in the book "Fables and bywords" – the only separate editions of Borovykovsky issued during the life of the poet. About 1859 because of serious illness Borovykovsky retired and the end of life lived mostly in his native village Melyushky where he died and was buried. Portrait Borovykovsky we served, made in 1830-s, a day flowering of his talent. Researchers believe Borovykovsky first representative of romanticism in Ukrainian literature. M. Zh., Jan 13, 2016.